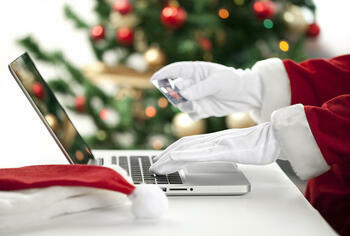 With the holiday’s right around the corner, the amount of your online shopping may be increasing. While this is a super convenient way to get all of your shopping done, it can also make you a target to phishers who are extra diligent during this time of year. Here are a few things to keep in mind as you start checking things off your shopping list. As the holiday sales hit full swing, you may be seeing quite a bit more emails than you’re used to. While this is a great way to inform people about sales and specials, it’s also an optimal way for hackers to access your financial information. For example, they may spoof an email from your favorite store, causing you to click on a dangerous link. Always go directly to the website to ensure a secure purchase. All secured website addresses will begin with 'https' and a padlock icon appearing next to it. If you do not see this, do not purchase anything from this website. It is not secured and may result in your information being stolen. Even if everything appears to be okay, if a website makes you uncomfortable, it’s best to trust that gut feeling and make your purchase from somewhere else. Free public Wi-Fi is a great convenience while you’re out running errands. Being able to compare prices and check inventories can help make any shopping trip smoother (and help save you money). However, hackers may be able to intercept your information on public Wi-Fi, putting you at risk. Only make purchases on internet connections that are password protected, such as your secure home network. If you need to make a purchase on your phone and there's only a non-secured option, use your data instead of Wi-Fi. Using credit cards is the safest way to shop online. If your debit card number is stolen, your account could be emptied before you realize what happened. After notifying your financial institution that your credit card has been stolen, you are not responsible for any purchases made and they’re refunded. Getting money back into your account could take weeks and you don’t have that kind of time around the holidays. Make your holiday shopping a little more rewarding with our Visa Awards card. For every dollar spent, you earn points towards travel, gift certificates, or cash back rewards. During the month of December, you can earn double the points on all purchases. If you would like to apply for a card, check out our website or the Cyprus mobile app for more information.